Colossal Turbo: Great ride, fantastic landscaping as well. 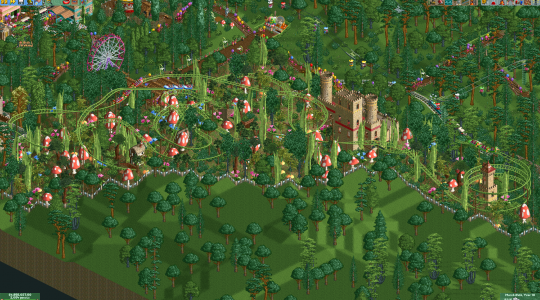 My only two critiques are that you should try to limit the jolting track transitions between pieces when possible (I know RCT3 makes it rather difficult sometimes), and that the paths are very unpopulated. You wouldn't even need to open the park to make them look better in that regard, more planters, benches, litter bins, storefronts, etc. would have greatly added to the overall aesthetic. Overall these are two small things in the grand scheme of it all though, great work on this. Seaside Salvager: See Colossal Turbo for the unpopulated issue that plagues this entry as well. This certainly isn't a bad entry by any means, I just don't think it's a Build-It! winning entry in this round. Some custom supports to match the ride type, and a more interesting layout would certainly help improve the build. Retro Rocket: Again, not a bad entry, just not a Build-It! winning one. The layout is a bit of a mess, and something that's built more for profit in a scenario than something that was planned out for a competition. I suggest spending a bit more time planning on your next build. 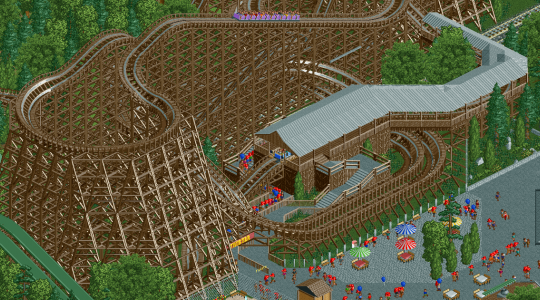 The Twister: Not much to comment here, it's a solid recreation of a solid woodie. Probably the only thing I can say is that the queue sign that wasn't made invisible with the Tile Inspector in screenshot one bothers me, but that's really it. Nice custom waterpark stuff too by the way. 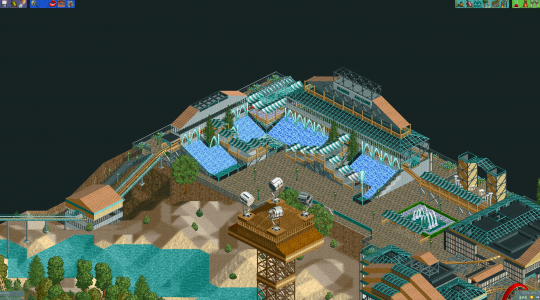 Firstly, I really appreciate the inclusion of the overview shot from the only RCT3 representation in this round. Get to see the bigger picture, which hasn't really been possible in recent times at least. I hope this can become a trend for future 3D projects in general, as people tend to focus too much on individual scenes rather than the whole when it comes to these games. After all, it's much easier to create small pockets of well-composed scenes than to then use those scenes to create a larger painting. More on this park later, though. Let's see how the RCT2 parks did. Seaside Salvager park is a nice venture into clean vanilla-styled aesthetics, something I really like when compared to more technically complex NCSO. All the structures are simple but work well, and whatever quality there is, is consistent throughout. Of course, there are some issues in it which hold it back from truly being great; the park tends to use a lot of teal in its palette in the CSO water around the station, the canvas awnings and in all the (partly CSO) glass roofs. Consider more variety in your shades and colours. The foliage, while decent enough, needed more careful placement of each tree and shrub to look more natural. The terraforming and terrapainting was average and required more attention as well. There seems to be an overload of path which could have easily been solved by just breaking one texture up a bit and including another path-type into the mix. Either on borders, or small evenly spaced spots in between, or really any realistic combo. I like how the tower overlooks the coaster, though. That's thoughtful, and something which our RCT3 park did as well. In a round full of just RCT: Classic schlock, this would have won, though that's not exactly flattering. Retro Rocket appears to be using the opposite philosophy of Seaside Salvager. It relies on scenario-based gameplay tricks to give us a park that I think did come right out of a scenario. This would probably be great for the gamer in everyone who plays RCT just to win objectives but we've come to expect a different style of parks in this competition so far. I'm willing to say this isn't what most people look for in a winning Build It! entry. I don't normally like realism entries and parks in RCT2 that are like The Twister. They're probably not good examples of real life brought into the game, but I think this has enough technical skill at display to appeal to me. Being full-on CSO, it kinda asks to have more micro detailing and being a recreation, there are sometimes those 'little things' you can include to make it feel immersive and get beyond any shortcomings the recreation itself has in real life. This maybe lacked that. Even small piles of trash or random bins and lights placed here and there can make something more interesting to look at. Maybe this literally is how Knoebels is, in which case, I don't have any memories to attach to that place and any enjoyment to come from pure nostalgia is lost. Clearly skilled workmanship, though. 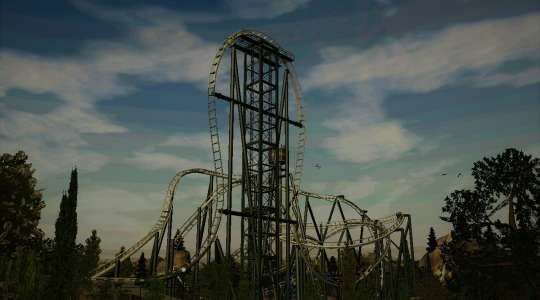 Colossal Turbo is the kind of RCT3 entry I was kinda waiting to see for a while for the reason mentioned at the top. The foliage seems pretty smooth and placed well, the architecture is abstractly modern to give a generic theme park vibe, and the rockwork and terrapainting is absolutely on-point. There's not much to fault about this entry, really. I guess for presentation's sake would have appreciated peeps and less path spam, something that affects this park much less than Seaside. The inclusion of planters in between it all helped a lot. Neat tower, too. Would have liked seeing it more clearly, maybe. Overall a well thought-out and well executed entry. Between Colossal Turbo and The Twister, I think The Twister had a more unique idea to it and therefore the more interesting entry for me. Though, surely a unique original idea should be better than just copying real life? In this case, Colossal Turbo happened to be a little too generic and sterile to pass off as a better idea to a recreation done really really well. The fact there wasn't much of a theme or main idea behind the entry hurt its chances for me. If this kind of technical execution could be applied to more in-depth ideas and themes we'd have an easy winner. Technical skill should only go so far when pitted against other entries in a competitive roller coaster making match, and I really wish to see more unique entries in this competition done well. Great match, though! I really liked 3 of the 4 parks in this round a lot for different reasons and had to find flaws beyond technical skill for at least two of them, which is good enough. TL;DR: Vote goes to The Twister. Quite an interesting round I must say. I 'm really happy with these entries! Colossal Turbo: Short but solid layout. A blessing for the eye. The theming is rather generic and dull, but its execution is done well. My favourite of all entries. Seaside Salvager: Really fond of the theming, but quite an odd layout. Overall a good entry, but not the best of the 4 in my humble opinion. Retro Rocket: Perhaps the layout is a bit overkill (ride is way too long for a realistic kiddie coaster), but its presentation is quite soothing in a way (if that makes any sense). Beautiful to look at. The Twister: Solid entry as well. Since I never rode its real life counterpart, I cannot say whether this entry does the original version justice or not. Layout looks good though. This round is looking to be tough! Colossal Turbo is pretty great, as are all the other entries. The twister took my vote. To reply to your main comment [Nave] about three entries lack a theme, realism and generic theming are a theme in their own right (something that very many people don't respect/realize). It may be boring compared to an extremely well done dark ride, or some fantasy steampunk build, but it is a valid theme nonetheless. When I look at this round I don't see three unthemed rides and one that is (if giant mushrooms and a castle count as medieval/fantasy theming anyway), what I see are four good entries: One being a scenario made ride that needs more focus and planning, another being yours which needs more polish and more planning for the layout (and I'd personally prefer some custom supports), and two very good realism coasters (that I still can't decide which should win). I am stuck trying to decide on the realistic ones. Realism is my first and primary factor, followed by a good theme. In my opinion, theming can sometimes be really vague but still tell a great story. For example, Mystic Timbers has a great theme but you have to invest yourself in the theme. My drawback on the first entry is that I fell it is somewhat unrealistic in terms of what Gerstlauer would do.